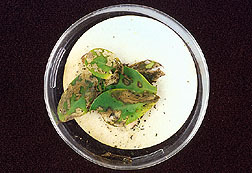 Lesser cornstalk borer larvae extensively damaged the leaves of this unprotected peanut plant. Visit a few of the experimental field sites in Tifton, Georgia, and you're likely to see—no surprise—rows of peanuts, among the state's top-grossing crops. A closer look might reveal slender insects called thrips probing around for sap. It's likely many are carrying the tomato spotted wilt virus (TSWV) that cost Georgia's peanut farmers $40 million in losses in 1997. Now, check out a different field plot and you might spy another costly menace: lesser cornstalk borers. Besides chewing on the pods that house the plant's tender peanut seeds, these caterpillar pests can also contaminate the crop with Aspergillus fungi that produce aflatoxin, a danger to humans. Such attacks are unwelcome in commercial fields but are hailed in Tifton's experimental plots, for they help scientists there hone new pest-proofing strategies for farmers' peanut crops. Much of this is cooperative research between scientists of the University of Georgia and USDA's Agricultural Research Service. Earlier this summer, for example, ARS entomologist Robert E. Lynch and UGA professor Peggy Ozias-Akins began field-testing genetically engineered peanuts that repel borers with an internal insecticidal protein from Bacillus thuringiensis (Bt) bacteria. It's not a new tactic, but one few have tried on a legume like peanuts, says Lynch, who heads ARS' Insect Biology and Population Management Research Laboratory in Tifton. Ozias-Akins is with UGA's College of Agricultural and Environmental Sciences. Lacking resistant cultivars, farmers ordinarily apply a soil insecticide to keep borers in check and prevent them from contaminating the crop with aflatoxin. 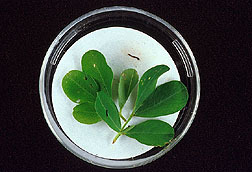 But a few bites of the Bt plants can deter the pests from further attack. In field tests last summer, for example, 90 percent of the Bt plants' pods escaped serious damage. The transgenic peanuts equipped with a Bt gene patented by Mycogen, a commercial collaborator, are still a way off from commercialization, says Lynch. Aside from regulatory approval, the peanuts must still prove their mettle in outdoor trials, where conditions fluctuate and borers are generally more robust than in the lab. After only a few bites of peanut leaves with built-in Bt protection, this lesser cornstalk borer larva crawled off the leaf and died. Ozias-Akins is also monitoring a field plot of peanuts engineered for TSWV resistance. The product of a gene-gun engineering procedure, the plants' cells make a virus-derived molecule that interferes with the pathogen's ability to replicate. In the lab, this protects the plant by robbing the virus of a chance to cause disease; out in the field, the results are mixed. "Last year, we had some plants that were clearly infected, and others that were not," Ozias-Akins reports. If the concept works, however, commercial peanuts bred from the high-tech strains could offset the virus' ability to overcome the few resistant cultivars identified thus far. One, Georgia Green, is now grown on over 75 percent of Georgia's peanut acreage, reports Albert K. Culbreath, of UGA's Department of Pathology. A member of the spotted wilt eradication action team, Culbreath helped build an Internet site farmers now use to assess the risk of an outbreak in their crop. It's based on seeding times, row patterns, tillage systems, cultivar choice, and other criteria. Even with resistant cultivars, Culbreath emphasizes taking an integrated approach to managing spotted wilt.—By Jan Suszkiw, Agricultural Research Service Information Staff. Robert E. Lynch is in the USDA-ARS Insect Biology and Population Management Research Laboratory, P.O. Box 748, Tifton, GA 31793-0748; phone (912) 387-2375, fax (912) 387-2321. To visit the home page for spotted wilt, go to http://sacs.cpes.peachnet.edu./spotwilt. "Tifton, Georgia: A Peanut Pest Showdown" was published in the November 1999 issue of Agricultural Research magazine.